This Wednesday, my father will turn 80 years old! My parents were going to come to Apple Valley to visit, but they aren’t going to be able to make it. So we have decided to take a road trip…1400 miles! You only turn 80 once, so Blue Rapids, Kansas here we come. We aren’t going to drive straight through for 21 hours, we will make the trip in three days so we can enjoy it more. 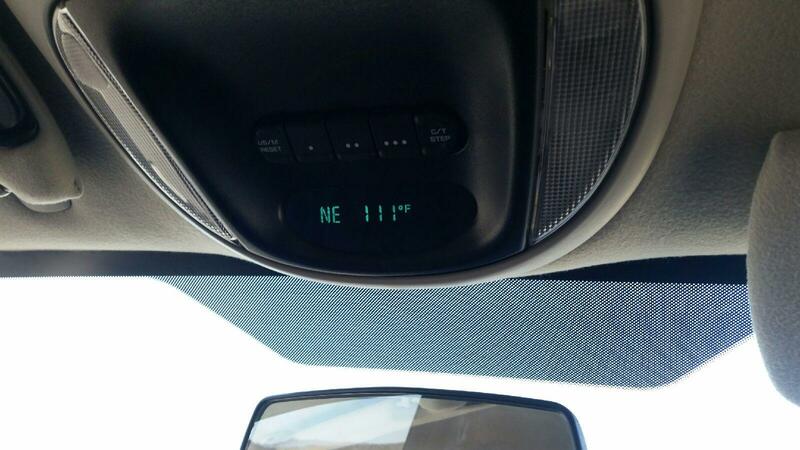 My wife Daphne, my son Zack and I left Apple Valley on Friday afternoon… it was already 95 degrees out. 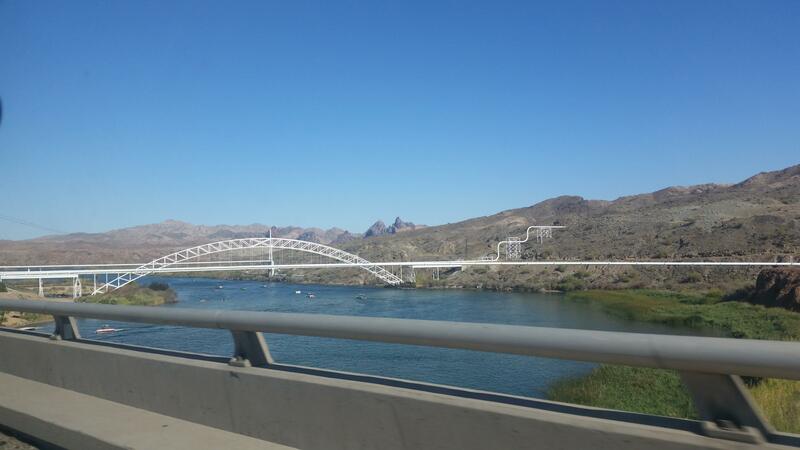 Not really a great time to cross the Mojave desert, but we got on interstate 40 and headed east towards Arizona. I 40 parallels what used to be Route 66, along the way you can see a lot of old empty buildings- most are in ruins. It must have been an interesting drive back in the day! By the time we drove to the Colorado river at Needles it was around 112 degrees (which is pretty normal this time of year) I bet that water feels good! We had a nice dinner in old town Kingman at El Palacio and then headed to Flagstaff for the night at a Days Inn. At 4 am, I woke up to 3 people speaking German… it was so clear that I thought they were in our room! Nope… the walls are just not insulated. When I got up, I noticed that there was a huge gap (1.5″) under the door that divides the two rooms! Not that big of deal, but I thought it strange. When we got past Gallup, New Mexico, I was surprised to see so much area that was volcanic. There was quite a bit of lava on either side of interstate 40… miles and miles! It makes you wonder if it could become active again in the future! I love the red colors of all the plateaus, mesas and hills in New Mexico. 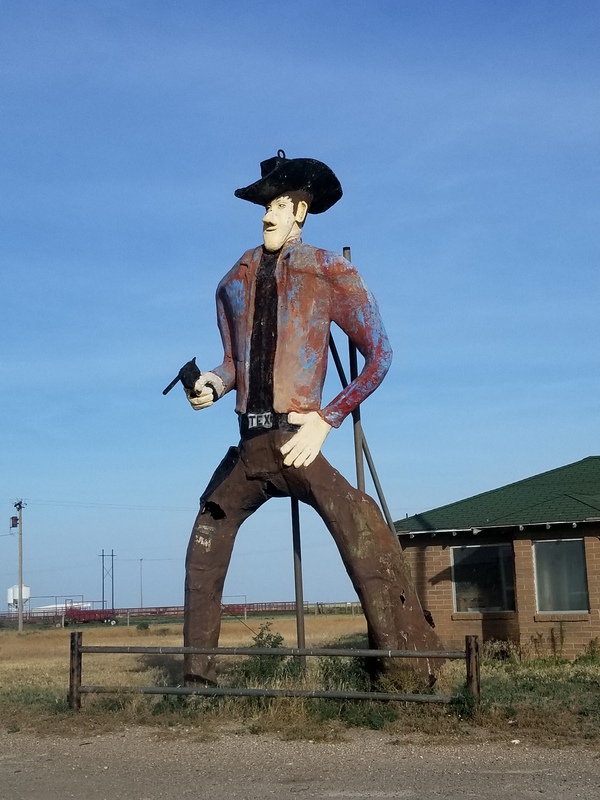 When we got to Tucumcari, we filled the gas tank ($2.09 / gal) and headed Northeast on the hwy 54 through Dalhart Texas, through the panhandle of Oklahoma and on to Liberal Kansas. Whew… I had my son drive a lot of this and he logged 5 states in 1 day! We travelled 700 miles today. There are thousands upon thousands of cattle in the feed lots of Dalhart Texas. Pro Tip: If you have to drive downwind of these feed lots, turn on your A.C. and set it to recirculate the air in the car! This statue has to be 30 ft high! Wish I knew what business it used to be guarding! My apologies to the Schartz family, but I found this sign amusing! On our third day we drove for 5 hours and met my parents for Fathers Day dinner at a restaurant in Manhattan, Kansas! From there, just another 45 minutes up to Blue Rapids. It feels good to not have to drive right away… It’s been a long trip, but its important to me. This entry was posted in Travel and tagged Arizona, Kansas, Route 66, Travel, vacation. Bookmark the permalink. What a great road trip and I hope your dad had a wonderful birthday!